We carry a large stock of rugs in store and to order, all varying styles and colours with new stock arriving on a weekly basis. From washable rugs suitable for bathrooms and bedrooms, faux sheepskin and real sheepskin rugs to the more traditional patterned rugs and chinese. 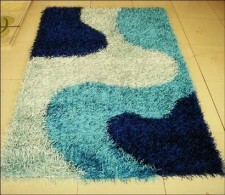 Modern long pile [ shaggy ] plain and pattern rugs and childrens theme rugs, High School Musical, Spongebob, Hannah Montana, Disney Princess to name just a few.